Four-wheel drive. Everyone seems to have it these days and, frankly, it's getting a bit boring. Mercedes realizes that too. But unlike everyone else, they're here to make a difference. That's where the brand new G63 6x6 comes in. 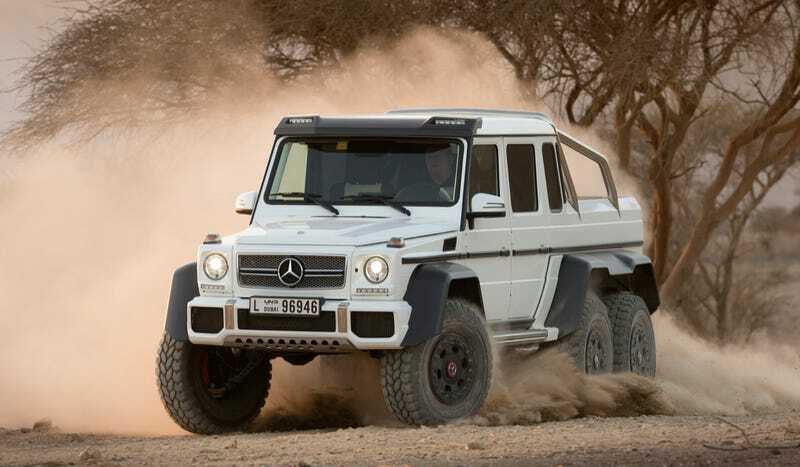 The G63 6x6 is six-wheel drive. That means it will be able to scale Mount Everest in total comfort, drive a group of four from China to Latvia with nary a worry, as well as terrify small indigenous tribes that have never seen a moving vehicle, let alone one that looks like it's out to murder you. However, you'll likely see it in its natural habitat, scaling the parking garage at the local galleria during a sale at Neiman Marcus. The G63 6x6 is powered by the G63's twin turbo V8. That equals 536 horsepower and 560 pound feet of torque. The torque split betwixt all six wheels is a nice 30:40:30. That adds up to 0 to 60 in under six seconds and a top speed of 100 MPH. That might sound slow, but it has 37 inch tires and weighs, weight (!) for it, 8,322 pounds. There are also five locking differentials, I guess so you can drive over everyone else waiting to valet park for the opera. It sounds like an absolutely manic offroader. It can ford depths of 39.3 inches, which should be enough to drive through the deepest puddles you'll find on a rainy day in Los Angeles. You can also inflate and deflate the tires from the inside, which means you won't scuff your shoes filling up the tires at the local Valero. The cargo bed is finished in polished bamboo, which sounds rather lovely. It'll also be a great way to transport your new Prada merchandise. To be serious for a moment, this thing looks incredible. It has off-road capabilities that you only dream of these days and can probably tackle anything you throw at it. It looks like it'll be perfectly at home on sand dunes and mountains. In fact, it looks like it would actively try and destroy you if you drove on a paved road. I love this thing. Mercedes will build about 20 to 30 of the trucks each year at a price of somewhere around $450,000. If you want one, you better get in line behind members of the Dubai royal family as well as Paris Hilton. Probably.